The image requirements for Amazon are actually pretty simple but Amazon has them spread out across multiple pages, sometimes contradicting themselves creating a lot of confusion. Amazon even has unique style guides for each of its 35 different product categories all of which have subtle inconsistencies making it easy to get overwhelmed. At Products On White, we deliver 1000's of Amazon photos a year, so we've learned a few things about Amazon photography. I’m going to summarize the key image requirements for Amazon and help make it easier for you. If you follow these basic rules, you’ll be fine. Disclaimer: This is a condensed version of Amazon’s Image Requirements consolidated from the multiple Amazon sources. Click the links below to read the exact image requirements. Every image you upload to Amazon must meet these basic requirements or the software will not accept it. See below for additional requirements. Main images have more restrictions than Secondary Images. Maximum Image Dimension 10,000px on it’s longest side. Image zoom starts at 1000px on its longest side & 500px on the shortest. Amazon accepts JPEG (.jpg), TIFF (.tif), or GIF (.gif) file formats. JPEG is preferred. 2000px by 2000px Square image. This is the max zoom. Cropped tight to the product to use the most space in the listing. Save it as a Jpeg with a 100% compression, Amazon will compress it again on upload. Save it as Srgb color space, if given the option. This is usually the default. The requirements are fairly broad, but in our experience the above settings are the ideal for formatting your product images for Amazon & meet the file requirements. Main listing images are the first image you see in the search and on the listing. They are by far the most important images in the listing. A better main listing photo will get more clicks and drive higher sales. Amazon is very strict about this photo but as long as you stay within these requirements, you can get very creative. Simply, you must photograph the product by itself on a white background. Must have a pure white background - RGB values of 255, 255, 255. The product must fill 85% or more of the image area. Images must not be blurry, pixelated, have jagged edges, or be cropped by a frame edge. Images must accurately represent the product that’s being sold and show only the product that's for sale out of its packaging. Must NOT be a graphic, rendering or illustration of the product. Must NOT show excluded accessories or props that may confuse the customer. Must NOT show graphic design, text that is not part of the product, or logos/watermarks/inset images. Must NOT show multiple views of the same product. Must NOT be on a visible mannequin, except for stockings or socks. Must NOT have external brand tags, except for stockings or socks. The requirements for secondary listing images are simple, they must meet the technical requirements for all images, but other than that you can do pretty much whatever you want. All images must meet the basic Technical Requirements. That's it! *For most of these articles you must be logged into your seller central account to access it. Every seller should read through the style guide for their product category at some point. Each guide contains about 30 - 40 pages of highly specific details. When it comes to the image requirements, with the exception of clothing, you can follow the summarized information in this article and be just fine. However, there are lots of great ideas in the Amazon guides on what type of image works best and specific examples of particular image arrangements. Clothing is different than all other sections and is the only category that allows models in the main image. Review clothing carefully to make sure you meet the standards. It's difficult to get approved in clothing, so hopefully you've already taken this step. On seller central you have the ability to add 9 images to a listing but only 7 slots will be visible in the listing. The 8th & 9th image is hidden unless the customer clicks into the image gallery. Therefore, we recommend planning no more than 6 images per listing because the other images are hidden and rarely seen and most likely not improve sales. Save that 7th slot for a video. The 7th slot is also a special slot for video and maybe 360 spin in the future. This video slot is powerful and should be used whenever possible. Why not create images for all 9, because creating quality photos cost money. If no one is going to see it then you shouldn't spend money on it. 1 Amazing Main Listing Image On White that stands out. 3 Explainer Images that show the features & benefits of your products using graphic design and great photos. 2 Lifestyle images created using stock photography and photoshopping your product into the scene. Creating it for real can be extremely expensive when done at a professional level. 1 product video that rules them all! Amazon creates a special zoom image depending on the pixel width of the image that activates when the customer rolls over the image. One common misconception is that you need a 3000px image to maximize the zoom effect. I did a test to find out how the zoom effect worked on Amazon. I uploaded 3 images at 1000px, 2000px & 3000px. I didn’t see a difference between the 2000 & the 3000px image. You don't need a 3000px image to get the full zoom effect contrary to popular belief. Between 1000px and 2000px you can have different levels of zoom. By limiting your max size to 2000px, your images will be a smaller file size which is easier to manage and you can use a lower megapixel camera to create them. Tip: Set your images between 1000px & 2000px for the zoom feature. You do not need an image larger than 2000px to access the full capabilities of your listing. Seller Central Processes & Compresses Your Images, So Don't Do It Twice. Don't compress your images, Amazon will do it for you. When you upload an image, the seller central software will automatically generate 1:1 square 500px compressed jpeg for the listing images. This important to know because when generating images to upload, it’s best to use no compression as double compressing images can lead to ‘compression artifacts’, essentially destroying the image. What’s nice about this, is you don’t need to convert your images to a different format, Amazon’s software will do that for you as long as the file is under 10 megabytes. This is handy because you don't have to do much image processing. Tip: If you're saving in Photoshop this means set your Jpeg compression to 12. In other software look for this compression setting and set it to max. 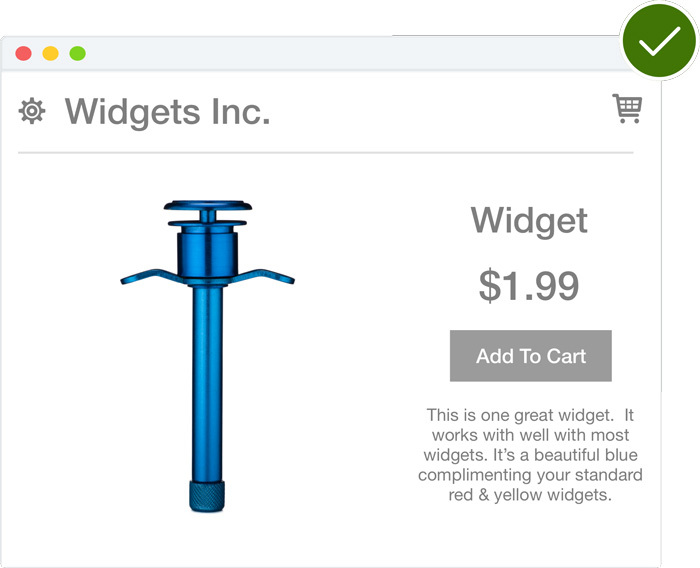 Plan on square grouping arrangements to use the max amount of spacing and have your products stand out. Amazon supports images that have been cropped to many different sizes. However, if the image is not square, it will add padding around the outside of the image to make it square. The red above is an example of what has been added, normally this would just be white. Creating arrangements that are long or wide won't use the entire square space making the images look smaller. This happens a lot with large groups or long items like an extended selfie stick for example. 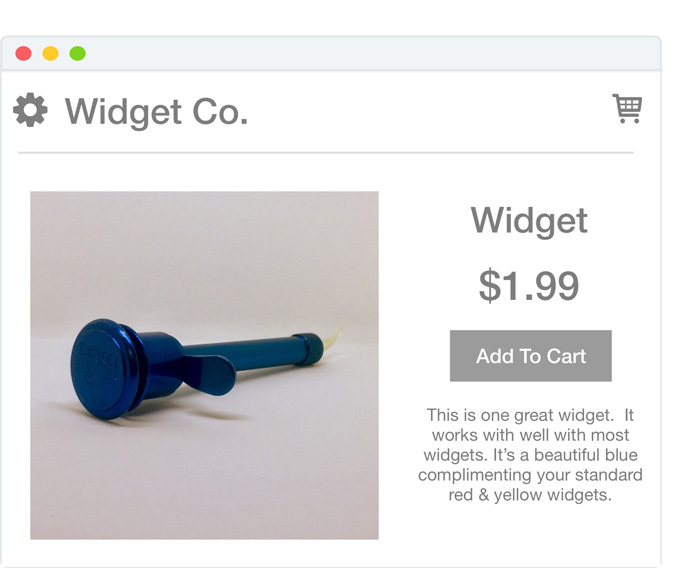 When uploaded to seller central, white space is added by the system to make the image square. Tip: Try to plan product arrangements that result in a final image that can be cropped square. On the left is the CMYK version open in Photoshop. On The Right is Amazon's rendering of the same image. You can see the colors are way off. For all you professional designers out there, be aware that some Amazon pages say you can use a colorspace of CMYK instead of sRGB. I actually tested this and found this to bad advice. The default colorspace for the entire web is sRGB and if the image is converted to anything else the colors of an image will not be rendered correctly despite what some may say. CMYK settings will render color correctly for a CMYK printing press and Amazon’s software will not convert the image to match a CMYK color space accurately. Tip: Save your images as SRGB for the web. This is pretty standard, but if the color is looking a inconsistent when you upload it, it may have been set to the wrong color space. In 2015, we saw a flood of customers coming to us because their listings were being flagged by Amazon for photos that did not meet the requirements. Since then, we have rarely seen or heard of a customer being flagged. This leads me to believe that policing goes in waves. I’m not saying you should ignore the policies but know that they are not always enforced. I say this because technically Glossy White, a background we offer with a glossy white reflection, breaks Amazon's image rules but many customers request it regardless. I haven't heard of these images being flagged yet. Tip: Follow the rules and break them at your own risk. Let Amazon Generate It's Own Multi-pack Logos. Don't add it Yourself. When you see this logo, typically it was added by the Amazon's system itself, not by the seller. To qualify, in the product listing editor > Vital Information Tab > Update Package Quantity to the quantity in the multi-pack. I've read conflicting reports say that it will add the logo automatically and another says that it is added randomly after updating. This is a trademarked image and shouldn't be used without permission. 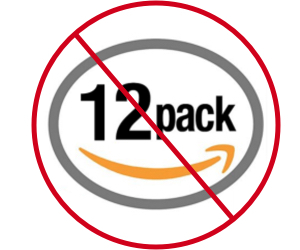 You can create your own non-Amazon branded multi-pack logo and use it on your secondary listing but I wouldn't use this one. Tip: Don't don't use Amazon's multi-pack logo, let Amazon do it for you. Main listing images: Sku#.MAIN.filetype, for example "12345678.Main.jpeg"
Secondary Images: Sku#.PT01-PT08.filetype, for example "12345678.PT01.jpeg"
Swatches: Sku#.SWCH.filetype, for example "12345678.SWCH.jpeg"
This is not a requirement, nobody is checking this and your image won't be flagged in the system if you just name it whatever your company prefers to name it. Tip: Name your file whatever you want. Following special naming conventions seems like a lot of extra work for no reason. Amazon Custom is a relatively new option for products that can be customized. Imagine a dog tag, a custom listing will allow you to add your own custom text and information before processing the order. As of late 2018, the image for the custom page needs to be formatted specifically to 400 px square. This is unlike regular seller central, where you can upload just about any image smaller than 10mb and it will be resized and converted automatically. This tip comes from customer information since we don’t have access to this part of seller central. So if you find this to be inaccurate please let us know. "To ensure proper alignment of your option images over your preview image, both are required to be 400x400 pixels. If you don't have the ability to create these assets, another option is to highlight choices on a "form" that you've uploaded as your preview image." Tip: The solution is simple, resize your image to 400px square before you upload it for this listing slot. Not all listings are created equal. If you look around you may find some listings have videos or images in the description fields. This is only available to listings that qualify for Amazons Enhanced Brand Content sellers who are Brand Registered. Only recently has this become available to all sellers. Tip: This is a great article on Amazon Enhanced Brand Content if you're interested in getting started. Uploading images to your listing is often the final step in setting up a listing. This is an exciting moment, however be aware that it takes 15 minutes or more for the images to manifest themselves on the listing. If you're not aware of this delay it's easy to think that something is wrong. Tip: Upload the photos and grab a cup of coffee and come back. It takes time for the photos to upload. In some of Amazon's style guides, they refer to a 300 DPI image as a requirement but this is an incorrect term and should be ignored. The pixel is a unit of measurement for computer screens & devices. A common misunderstanding is that DPI (dots per inch) relates to image size online. DPI only relates to physically printed images and is used to convert a pixel length to physical inches. So if I my computer image is 3000px by 3000px on my computer screen, that is its size. There is no dpi relation to a computer only image. If I wanted to convert that to physical inches and print it on an inkjet printer, then I would divide 3000px/300dpi to get a 10 inch by 10 inch physical print. Also, different printers print at different DPI resolutions, so 300dpi reference isn't even accurate for all printers. This subject can get very confusing if you start to talk about different screens, resolutions and placeholders. Try to just focus on this; with images on the web, you only need to look at the pixel dimensions, the height and width in pixels. Tip: Ignore the 300 dpi reference, it doesn't mean anything unless you're printing the photo. The Main Listing Image is by far the most important image in a listing. Next to price it is the most important element in converting sales and driving traffic to your listing. Bad photos will make your brand look untrustworthy and poor quality. Experts generally agree that a professional product photo vs an DIY Iphone photo for the main listing image will see a 20% increase in sales, but we have heard of much higher returns from our customers. So if you're going to invest in anything, the main listing image is it. You can skimp on the secondary images and get away with it. There are lots of professional options and it will be worth the investment. Tip: If anything else, make your main listing image look amazing! I know what you're thinking, here comes the sales pitch but let me explain why hiring a professional makes sense from a time and money aspect before you leave. Photos are one of the most important aspects of a listing. A great picture can make your product look awesome, increase click through rates and sell more products. Bad photos can make your product look low quality. So why go cheap DYI route if it's so important? If you're deciding to do it yourself vs hiring a professional, then ask yourself this question, "Is it worth it?" Studies and experts agree that Professional photos sell significantly more products on Amazon then DIY. Do the math. If it costs $80 to get professional photos and you see a 20% increase in sales over the lifetime of the listing, does that justify the cost? Professional photos are an investment that will continue to return over the lifetime of your listing. Do you have all the equipment, skill and time to photograph it yourself properly? Would it cost more to get all the stuff then to hire a professional? Try it out for free. Switch out your main listing image with a professional image and measure the ROI (Return On Investment). If you see an uptick in sales and clicks compared to before, then calculate how much you would see over the lifetime of the listing if you upgraded your photos to professional photos. You can run this test for free by signing up for a free test photo below. Newer PostHow Cocovit Does Social Media Right!